6 Elements of Social Justice Ed. : "Uncle Willie and the Soup Kitchen"
Title: "Uncle Willie and the Soup Kitchen"
"Uncle Willie and the Soup Kitchen" Class Play. The students each take on a role and act out the book in order to learn about it's message of hunger and homelessness awareness. Support and information for teaching the connection between wealth/poverty and race as well as other social issues that effect the instances of homelessness and lack of basic needs. This link has several sets of lesson plans as well as background information on the topics and connections to be made. 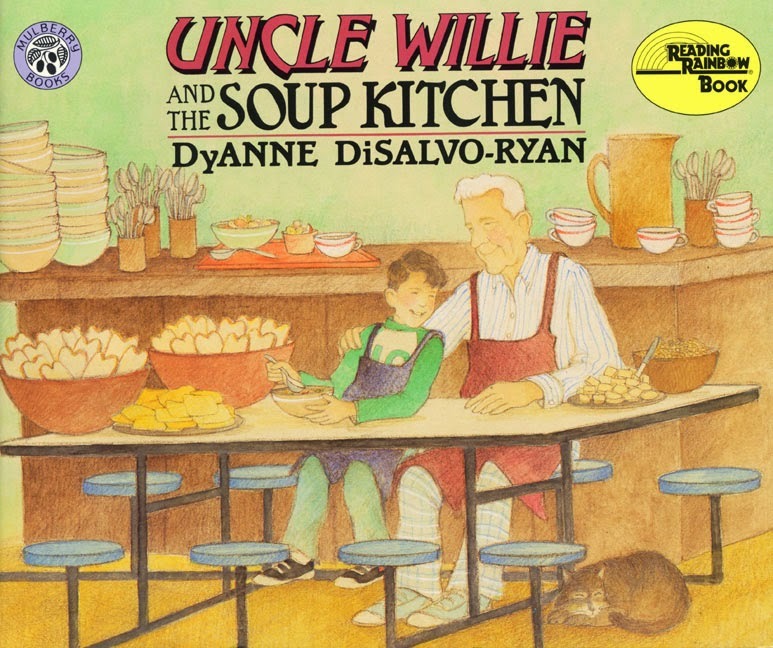 "Uncle Willie and the Soup Kitchen" is a story and first person narrative of a young boy's experience with his uncle at soup kitchen and his subsequent awakening to the issue of poverty and it's related problems of hunger and homelessness. Through his experiences at the kitchen, specifically his interactions with the people who come there, he learns that hunger is not exclusively a problem that the homeless face, but rather that it affects many in many different situations and walks of life. His uncle Willie gives him insight and guidance about hungry, homelessness and poverty in their community during his visits and in result, helps the boy in developing a critical consciousness about social issues affecting the area he lives in. The language and structure of the book is straight forward and presents these multiple elements without prejudice and in a manner that is easily digestible for students. While targeted for children in grades k-3, there is no doubt that the language and message can be readily applied as high as 5th grade. For younger children, the vivid illustrations provide clear representations of the content, dialog and events of the story as it unfolds. Some books in this genre touch on social issues with the intention of explaining them but this book is different in that it serves to directly model the process of developing a critical consciousness that I mentioned previously. Because of this, the book itself not only serves as a resource, but as a lesson in itself. Depending on the way the book is presented, exposure to the content can serve as either or both. Children learn about the issues of homelessness, poverty and hunger as problems that transcend a singular socioeconomic status and stereotype. They are also exposed to one of the many ways that people can become active members of their community to not only raise awareness but work for change, a directive both whole fully included in element 5 and 6. In the end, the story serves to both teach becoming aware and how to make awareness an active process instead of a static definition. These are heavy focuses and elements but the language in which they are presented in, makes them naturally obtained as the child reads or is read to. The children learn that awareness is not an ability but instead, a social process requiring active participation. Children are broken into two medium/large groups. On each wall of the room, a large lined paper is hung with either the title: "hunger" or "homelessness". Each group is given a social issue: hunger or homelessness. Groups must write down first, what the issue is, then ways they have seen or can think of for helping others effected with said issue. After the groups write down their responses on the large paper, swap and change station to the other groups paper. Now the groups repeat the process. After both groups write down their responses for each category, they are given a green and yellow sticky tab. Children are directed to read over the responses of each list and put a green tab for the thing they think is most important and yellow for something they don't understand or want to know more about. After all children place their tabs, the class tallies the responses for the most green and yellow. These responses are discussed further. Runner up responses are also discussed. Exit card: "I can help solve hunger by..." or "I can help the homeless by..."